On the National Foundation Day, February 11th, though it was the coldest season of the year, I visited Oku Matsushima in Miyagi Prefecture to take part in a symposium organized by the Commission for Reconstruction and Utilization of Treasures in Oku Matsushima. In the Meiji Period, a canal was built connecting the mouth of the Naruse River, which is a first-class river, and Matsushima Bay. Known as the Touna Canal, it enabled ships to sail directly to the gentle waters of Matsushima Bay without going the long way round the peninsula in the open ocean. Agricultural products, including rice produced in the Naruse River basin, as well as products produced in the Kitakami River basin were frequently transported this way. Once ships reached Matsushima Bay, they could easily reach Sendai. From Sendai towards the south, there was the Teizan-bori Canal, through which ships could directly reach the mouth of the Abukuma River, from where they could continue south in the Pacific Ocean. The canals of Tohoku, including the Touna Canal, were important infrastructure for water transport between the Tohoku and Kanto regions. Japan has developed unusually intricate networks of water transport. This is partly due to the topography of the Japanese archipelago, in the center of which lies a backbone mountain range stretching from north to south. This differs from the UK, another island country. The topography of the UK is almost flat compared to that of Japan. Even the highest of the UK’s mountains are about 1,300m in altitude, and all of them are located in northern Scotland. Due to this topography, they used horse-drawn carts on land. In contrast, in areas with steep mountains, Japanese people couldn’t travel by land as the British did. Though there are some plains, they are wetlands which become muddy once it rains even a little. 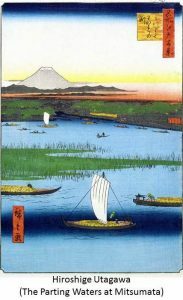 People living in Japan had no choice but to give up on land transportation and establish water transport systems on the sea around the islands. 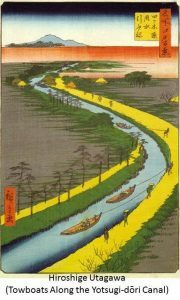 Figure 1 shows water transport networks in the late Edo period, about 200 years ago. These networks look like spider webs. The most remarkable thing about the figure is that the names of various places even along the rivers are indicated. These are harbors along the rivers. Harbors and water transport networks were constructed not only along the coast but also along rivers in inland areas. Hiroshige Utagawa, a famous ukiyo-e artist, often drew pictures of water transport in the Edo period. Figure 2 depicts a boat sailing upstream with all its sails set. Figure 3 shows strong porters carrying luggage in a small boat through a narrow channel in the upper reaches of the river. There were water transport networks both inland and on the sea all around Japan. In the Edo period, rice, timber, oranges and many other things were shipped to Edo from all over Japan. After unloading its cargo, a ship must be loaded with ballast to stabilize it on its return journey. Ships retuning from Edo carried kawaraban (tile block prints, the newspapers of the time), ukiyo-e (Japanese woodblock prints), and ezoushi (picture books) published in Edo (now Tokyo) as well as kimonos, handicrafts, and works of art that had been brought to the city from all over Japan. Edo was a kind of showroom, where all sorts of goods brought from every corner of the nation came together and were exhibited. Ships arriving from rural areas unloaded their cargo in Edo and the crews used the money they had earned to buy many rare items they could get only in Edo. They carried these things by ship back to their homes. The Kawaraban was a means of transmitting information, as were ezoshi and ukiyo-e. 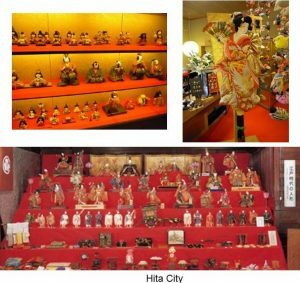 In a sense, handicrafts, including dolls were also a means of transmitting information. People living in every corner of Japan shared information from Edo. It was said that people across the country got news of the raid by Ako roshi within ten days through kawaraban. People shared information through goods, read kawaraban, and discussed the news with a common language. People who share information, read, and speak in the same language belong to the same community. Japan is a land divided by mountain ranges, straits, and rivers. Those living on this archipelago, which stretches 3,000km from north to south and is topographically divided, form a community. The infrastructure that helped create this community was the web-like networks of water transport systems. These fostered a sense of community and identity amongst the Japanese. In 1853, the American Commodore Perry and his black ships arrived in Tokyo Bay. Japan quickly transformed itself from a Shogunate-feudal system to a nation-state. In 1890 (Meiji 23), the Imperial Diet (parliament) was formed. There were no interpreters in the Diet. Later on, an election of Diet members was held and the elected members gathered from every district of the country. In the Diet, everyone spoke Japanese and there was no communication barrier. The destiny of languages since ancient times is that they diverge. That is also the destiny of human beings, as is described in the story of the Tower of Babel in the Book of Genesis. In 1979, the European Community (EC), predecessor of the European Union (EU), was established. The EU stretches 3,500km from north to south, almost the same as the Japanese archipelago. Currently, 27 countries belong to the EU and 23 languages are designated as official languages. It’s surprising how many different languages are used. 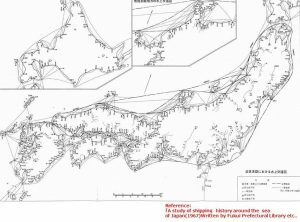 In contrast, it is almost a miracle that the people of the Japanese archipelago, which is topographically divided, have used the same language for over 1,000 years. The water transport networks along the coast of Miyagi Prefecture, along with the nationwide water transport systems have enabled the Japanese to maintain a common language. Higashi Matsushima sustained serious damage in the Great East Japan Earthquake, which occurred on March 11, 2011. 1,110 people lost their lives and 24 are still missing (as of January 13, 2017). I spent a lot of time worrying about what to speak about at the symposium in Higashi Matsushima. I hit on the idea that the water transport system along the coast of Higashi Matsuyama had helped to foster the Japanese identity. I was able to talk about this with gratitude. On February 22nd, the JWF hosted a symposium entitled World Water Day in Tokyo 2017 for Future-proofing our Society. It was attended by 110 participants, including speakers. This is the second year since the SDGs were established. It is essential that a variety of players work together towards achieving the SDGs and solving other environmental issues. World Water Day in Tokyo 2017 focused on companies as important players. The outcomes of this symposium will be published as Messages from World Water Day in Tokyo 2017. On February 22nd, the WSCJ, for which the JWF serves as secretariat, held the 15th meeting of the Committee for Basic Policy.